You'll love Grandma's toffee recipes. This old fashioned candy is a delicious, chewy treat, and one of the world's favorite heritage confections. Homemade butter toffees always taste much better than any you buy in the stores, and making them can be a fun activity for your whole family. Why not plan to make some tonight? Of all the heritage, homemade candies, these toffees are the ones we most enjoyed eating when I was a kid. You'll enjoy them too. 1-1/2 pints of sugar, 1/2 pint of cream, 1 tablespoon of good vinegar. Boil until it hardens when dripped into cold water. Pour into buttered pan and mark in squares. 3 tablespoons of white sugar, 3 tablespoons of molasses, 2 tablespoons of water, 1 ounce of butter, a very small quantity of baking soda. Boil mixture until it is brittle. Pour into buttered pan. Two cupfuls of sugar, a tablespoonful of vinegar, half cupful of honey, a tablespoonful of cold water, and a tablespoonful of butter. Boil altogether for twenty minutes and test. Great care must be taken not to let the honey burn, as it does so very easily. This toffee recipe calls for hickory nuts, but it is also delicious when made with peanuts, cashews, walnuts, or almonds. Brown sugar can be substituted for maple sugar if unavailable. Two pints maple sugar, half pint water, or just enough to dissolve sugar; boil until it becomes brittle by dropping in cold water; just before pouring out add a tablespoon vinegar; having prepared the hickory nut meats, in halves if possible, butter well the pans, line with the meats, and pour the toffee over them. Three cups brown sugar, one-quarter cup butter, one-half cup cold water. Allow the sugar and water to boil a few minutes before adding butter, then let cook until it is brittle when tested in cold water. Pour on buttered pan and cut when cold. Put butter, 1/4 lb, into a suitable dish, with brown sugar, 1 lb; stir over the fire for 15 minutes, or until the mixture becomes brittle when dropped in cold water; add lemon or vanilla flavoring after the cooking is completed; cool on flat buttered tins and mark in squares, before cold, so it can be easily broken. Put loaf sugar, 1 lb, into a brass pan (any saucepan will do) with a cup of water; beat 1/4 lb of butter to a cream; when the sugar is dissolved add the butter, and keep stirring the mixture over the fire until it sets firm, when a little is poured on a buttered dish. Just as it is done add 6 drops of essence of lemon. Butter a tin, pour on the mixture, 1/4 to 1/2 inch thick, and when cool it will easily separate from the dish. Mark off in squares, if you wish it to break easily. Everton Toffee was invented sometime in the 1760s by Molly Bushell of Everton, now a suburb of Liverpool, England. She established a confectionery house called Ye Anciente Everton Toffee House, and the fame of her toffees lightly flavored with lemon or ginger spread far and wide. 1 quart good molasses, 1 cup vinegar, 1 cup sugar, butter the size of an egg, 1 teaspoonful saleratus (baking soda). Dissolve the sugar in the vinegar, mix with the molasses, and boil, stirring frequently, until it hardens when dropped from the spoon into cold water; then stir in the butter and soda, the latter dissolved in hot water. Flavor to your taste, give one hard final stir, and pour into buttered dishes. 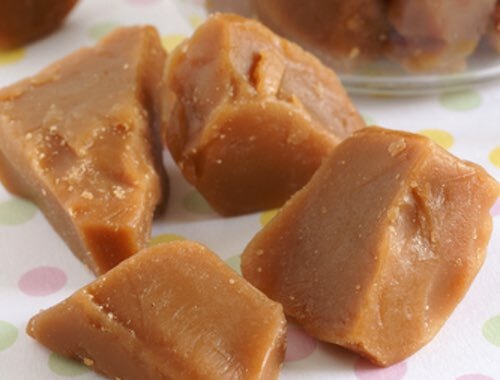 As it cools, cut into squares for toffee, or, while soft enough to handle, pull white into sticks for taffy, using only the buttered tips of your fingers for that purpose. Nowadays, people have become so accustomed to buying a package of candy at the store, few even consider making their own. What a shame when it's so easy! Homemade candy tastes so much better than any you can buy, and making it can be a fun activity for the whole family. Very few of today's kids have ever had the fun of scraping the pot clean while waiting for their candy to cool in the pan. And less still have experienced an old fashioned taffy pull. That's where these homemade toffee recipes shine. Grandma's old fashioned candy recipes provide affordable fun for your entire family. Toffee and taffy are similar with similar ingredients, yet different. Toffee is poured onto a buttered pan and cooled to form a hard and brittle brownish slab that's broken into pieces. Taffy is pulled and stretched to form a lighter and softer candy that's cut into small chewy pieces.